John Benton, a veteran of 31 years of coaching experience, including 14 seasons in the NFL, is in his second season as the 49ers offensive line coach. Under Benton’s tutelage, the 49ers offensive line continued to improve throughout the season. Anchored by T Joe Staley, who was selected to the Pro Bowl, the offensive line helped the 49ers offense rank 12th in the NFL, averaging 349.2 yards per game. San Francisco also registered 3,925 net passing yards, the most by the team since 2000 (4,239). In 2016, Benton served as an assistant offensive line coach for the Jacksonville Jaguars. Under the guidance of Benton and assistant head coach/offensive line coach Doug Marrone, the Jaguars offensive line allowed 34 sacks, the fewest sacks allowed in a single season since 2007 (31) and 17 fewer than the team allowed in 2015. Seeing improvement as the season progressed, the Jaguars offense ranked fifth in rushing yards per game (124.5) during the second half of the 2016 season (weeks 9-16). Prior to Jacksonville, Benton spent two seasons (2014-15) as the offensive line coach for the Miami Dolphins. In 2015, the Dolphins averaged 4.35 yards per carry, good for ninth in the NFL while RB Lamar Miller tied a career high with eight rushing touchdowns. In 2014, Benton’s offensive line helped the Dolphins offense produce 361 first downs, tied for the second-most in franchise history and the most since 1985, when the team had the same amount. The line paved the way for Miller, who surpassed the 1,000-yard rushing mark (1,099) for the first time in his career, and helped protect QB Ryan Tannehill, whose 4,045 passing yards were the most by a Miami quarterback since Dan Marino (4,453 yards) in 1994. Miller and Tannehill combined to become the first duo in franchise history to produce a 1,000-yard rusher and 4,000-yard passer in a season. Prior to Miami, Benton served as the offensive line coach for the Houston Texans for eight seasons (2006-13). With the Texans, Benton’s offensive line was instrumental in establishing one of the NFL’s top-ranked offensive attacks, setting franchise marks for rushing yards (2,448) in 2011, and passing yards (4,654) and total offense (6,129 yards) in 2009. Behind All-Pro T Duane Brown and All-Pro C Chris Myers, Houston’s offensive line helped All-Pro RB Arian Foster become the 13th fastest player in NFL history to reach 5,000 career rushing yards. Additionally, Foster registered three consecutive 1,000-yard seasons (2010-12) and a franchise-record 25 career 100-yard rushing games. In 2012, Benton’s offensive line anchored Houston’s third consecutive 2,000-yard rushing season as Foster led the NFL with 15 rushing touchdowns. Foster surpassed the 1,000-yard mark for the third consecutive season behind the play of Myers and Brown. Houston’s offense ranked seventh in yards per game (372.1) and eighth in points per game (26.0) while allowing 28 sacks, the fourth fewest in the AFC. The Texans offensive line helped pave the way for a franchise record 2,448 rushing yards in 2011. Excelling in the playoffs, the Houston run game averaged 159.5 yards per game in helping the Texans reach the Divisional round. For the first time in franchise history, the Texans had two players eclipse 900 rushing yards in the same season as Foster recorded 1,224 yards and RB Ben Tate notched 942 yards on the ground. Both Foster and Tate rushed for 100-or-more yards in the same game twice during the 2010 season, making Houston just the sixth team since 1985 to accomplish the feat. In Benton’s system, Myers was selected to his first Pro Bowl while Brown was selected as a Second-Team All-Pro by the Associated Press. Benton’s unit paved the way for another record-setting season for Houston’s offense in 2010. The Texans ranked third in the NFL with a franchise-record 6,186 yards of offense (386.6 yards per game) and helped Foster lead the NFL in rushing yards (1,616) and total touchdowns (18; 16 rushing, two receiving), each setting a new single-season franchise record. In 2009, the line provided protection for the NFL’s passing leader, QB Matt Schaub, who threw for 4,770 yards and 29 touchdowns. The offense ranked fourth in the NFL with an average 383.1 yards per game. The passing attack led the NFL with 290.9 yards per game while Benton’s offensive line group gave up the fifth-fewest sacks in the league (25). Benton’s line featured the same starting lineup for all 16 games, a first in Texans history, in 2008. The offensive line paved the way for rookie running back Steve Slaton to set a then-franchise record with 1,282 rushing yards, while the offense ranked third in the NFL with 6,113 total yards. In 2007, Benton’s offensive line group allowed 22 sacks, the lowest total allowed in franchise history. In his first season in Houston, Benton oversaw an offensive line that surrendered 25 fewer sacks (43) than in 2005 (68). Prior to joining the Texans in 2006, Benton spent two seasons (2004-05) with the St. Louis Rams, coaching an offensive line that was anchored by All-Pro T Orlando Pace. In 2005, the Rams offensive line helped All-Pro RB Stephen Jackson rush for 1,046, the first 1,000-yard season of his career. Prior to the NFL, Benton spent 17 years coaching at the collegiate level.  He began his coaching career as a graduate assistant at Colorado State (1987-90) before moving on to California University (PA), where he coached the offensive line and served as the recruiting coordinator (1990-94). Benton returned to Colorado State in 1995, where he spent nine years as offensive line coach (1995-99) and co-offensive coordinator (2000-03). A native of Durango, CO, Benton was a four-year starter as an offensive lineman at Colorado State (1983-86) and earned honorable mention All-WAC honors during his junior and senior seasons. He was named to the WAC’s All-Academic team as a senior in 1986. Benton and his wife, Nicole, have two children: Gabrielle and Paige.